My husband and I have wanted to travel to Vietnam for many years now and after watching numerous episodes of Vietnam on Anthony Bourdain's "No Reservations", and Luke Nguyen's "Vietnam", it's time to go! Looks like such a beautiful country with incredible people. In the meantime, we are very fortunate that we live in the Bay Area and have about 10 Vietnamese restaurants within 10 miles of our house. However, it's almost impossible to find a Vietnamese restaurant that makes a vegetarian broth base for their Pho. Since the broth is considered to be the most "important ingredient" of the soup, it has to be really good and it took me some time to develop the right depth of flavor using just vegetables. I know that the list of ingredients looks long and daunting, but once you make the broth, it's really quick and easy. I love this soup, I could eat it morning, noon and night regardless of the season or the temperature outside. Heat broiler and roast shallots and ginger until slightly charred. Let cool, peel shallots and slice ginger into 1/4 inch slices. Set aside. Heat canola oil in a large 8 quart stock pot, add sliced onion and sliced mushrooms and cook until onions are caramelized and mushrooms are dark brown. Add a little water if necessary to prevent burning. This is where you need to develop the flavors of the mushrooms and the onions--kind of like making french onion soup, low and slow until caramelized and yummy. Next add the carrots, parsnips, whole garlic, peeled shallots, and sliced ginger and saute for a couple of minutes more. In a dry saute pan, toast spices until fragrant and then add to mixture. Add water and the soy sauce and bring to a boil, then reduce heat to medium-low and simmer for about an hour or more until flavor develops and broth has a rich deep color. While the soup broth is simmering, prepare the condiments and the other soup ingredients. You can add any combination of vegetables, tofu or tempeh you like, but these are my favorites. Place rice noodles in a bowl and cover completely with very hot, almost boiling water. Let noodles sit covered for 40 minutes while broth is cooking. Prepare all ingredients above and set aside. Strain stock through a fine mesh strainer using a ladle to remove as much liquid as possible from the cooked vegetables and return broth to the pot and bring to a simmer. Add sliced onions, green onions and cook for several minutes until almost tender. Add tofu, carrots and bok choy (if using) to broth and cook for a couple more minutes. 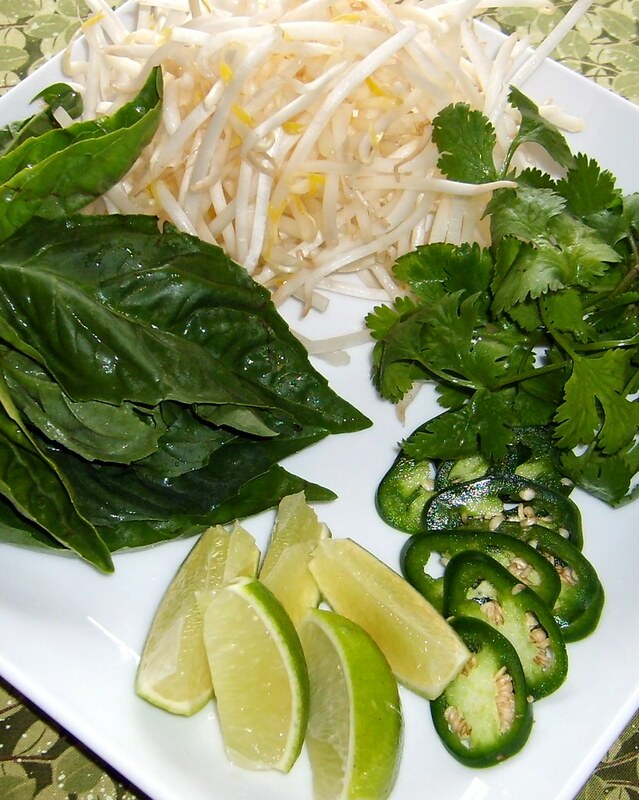 Just before serving, drain rice noodles and portion out into serving bowls. 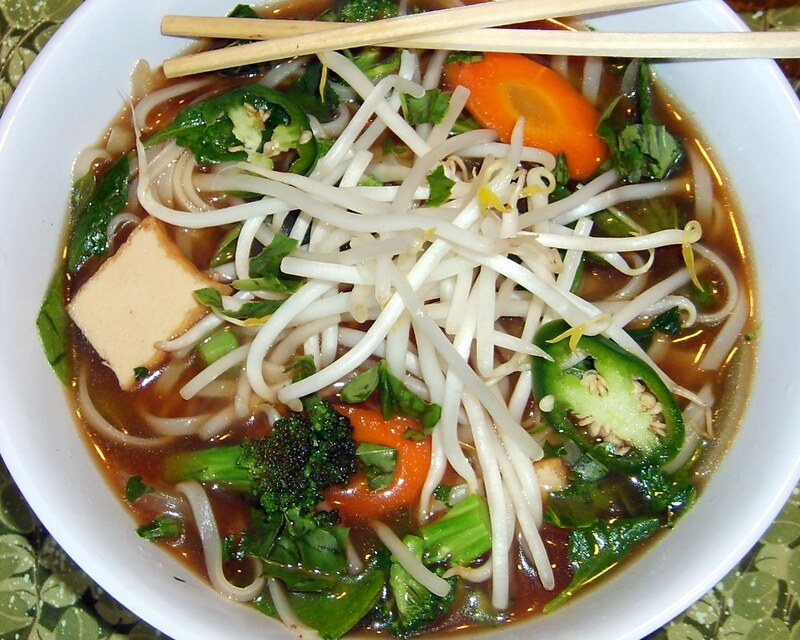 Immediately add broccoli, spinach and cilantro to broth and ladle all vegetables and broth over noodles. Garnish with condiments of choice and enjoy! Can't wait to make this! A couple questions: 1. how many does this recipe serve? 2. Have you ever frozen the broth for later use?